A new French word this year for us. Near the beginning of our trip up in Luché-Pringé, France was already suffering from a lack of water. Two glorious weeks later, things were getting worse and the drought had spread to most of the French departements. It looks as though it may have come to an end. We’ve faired quite well in Figeac at which we were frequently surrounded by threatening clouds whilst enjoying a good amount of sunshine ourselves. We began referring to “the Figeac hole in the clouds”. Doubtless, it was just coincidence, though. Then, in what seemed like a dismal repeat of last June, we heard that poor old Draguignan in Provence had once again suffered floods. June seems to be becoming a bad time to visit Provence. Today we travelled about 120kms/80mls from Figeac to Réalmont, half way between Albi and Castres. With the skies darkening all the time, we were frequently driving through light rain. Since arriving at 2:00 PM, it has been raining steadily and almost continuously. Along with the now unsettled weather in the mountain regions, I’d say the French water stocks will be being topped up. Nobody really wants a drought and this is the first day of rain that we’ve had in 3½ weeks so we can’t complain. It’s amazing, though, how quickly rain gets very old and tiresome when one enjoys an outdoor lifestyle. On a day as dismal as this, I have been very grateful that I was not in a tent. I remember rain and canvas being an unpleasant combination. Even with an out of commission water system, Guillaume is relatively comfortable, especially now that we have re-pitched with no overhanging trees. Basic camping rule: trees continue to drip on roofs and are bad news when trying to sleep. Duh! Since nothing much has happened today other than a journey that felt tiring over twisting, hilly, bumpy roads largely in rain, here is a little gem that we spotted lurking about in the grass on our recent tour of the Célé valley. I use the word “gem” advisedly. There is no plain English term for this spectacular character who, I believe, rejoices in the scientific name of Hoplia caerulea. He is a member of the scarab/cockchafer family but my book leaves me unclear whether he is a scarab or a cockchafer. 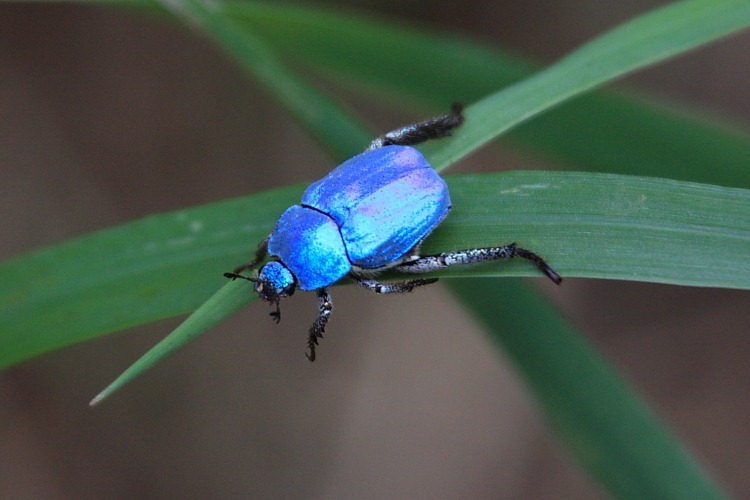 As I recall, the Egyptians were quite fond of scarabs and, given the stunning blue colour of this character, I can see why. Jewels pale into insignificance. With my tourist hat on, I hope it stops raining overnight.